ShoreTel's new docking station and Mobility client can transform smartphones and tablets into desk phones. An increasingly mobile workforce requires business communication tools that can follow them anywhere -- like tablets and smartphones. Many of those same employees, however, still put down their mobile devices when they sit down at their desk and pick up their trusted, ergonomically superior desk phone. Mobile devices can untether users from their desk, but tucking a smartphone between an ear and shoulder while typing at a desk remains clumsy. Users still have to switch between their mobile devices and desktop-based tools, depending on their work environment. Now ShoreTel has announced ShoreTel Dock, an enterprise-grade docking station that turns any iPad or iPhone into a desk phone when it's paired with ShoreTel Mobility, a downloadable client that extends the vendor's unified communications (UC) applications to mobile devices. "Employees are using their mobile devices when they are on the move, but there has been this need regarding what to do with [the device] when they return to their desk," said Rich Costello, senior research analyst for UC and enterprise communications infrastructure at Framingham, Mass.-based IDC. "The docking station is unique, and will fill this need." Brown and Caldwell, a Walnut Creek, Calif.-based environmental engineering and consulting firm with 45 offices, will be rolling out the ShoreTel Dock to a small group of its mobile workers who have been taking advantage of the company's bring your own device (BYOD) policy, said Mark Lencioni, senior manager for IS Engineering at Brown and Caldwell. "We just rolled out a BYOD strategy last year, and it has been widely successful," Lencioni said. Brown and Caldwell's 1,500 employees use ShoreTel's hardware and software UC tools across the country. With the dock, mobile employees will have a UC interface they are already used to, with new features -- like presence and caller ID built into their desk phone, he said. "The docks will save us a lot of time," Lencioni said. "Field employees are using their tablets to do their data entry, and taking meetings wherever they are … [We] will start our rollout by working with our BYOD employees and finding the most appropriate use cases." Even though IT has embraced the BYOD trend, mobile devices still have limitations -- including battery life, call quality, and comfort. Businesses won't abandon their hardware-based desk phones as long as these constraints remain, said Pejman Roshan, vice president of product management at ShoreTel, in an interview. 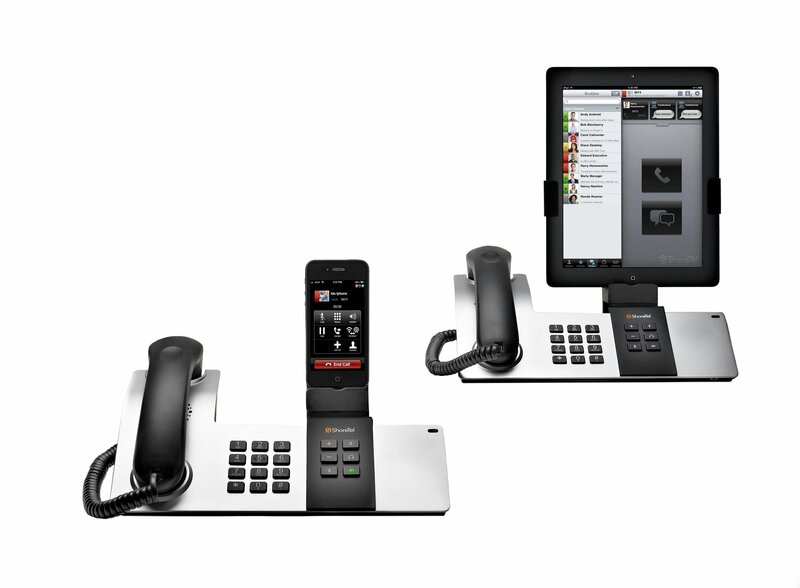 When combined with the ShoreTel Mobility application, the dock gives any iPhone or iPad the performance and comfort of a desk phone, as well as the features of a software-based UC and collaboration tool. ShoreTel Mobility gives users extension dialing, call transfer and directory query functions on their smartphones. They also can take advantage of its instant messaging, presence and conferencing features both on the road and while plugged into the ShoreTel Dock, Pejman said. The docking station -- which operates as a thin client -- will give users a typical desk phone experience when they're connected with an Apple mobile device, allowing them to answer incoming calls through a handset. It also will charge the mobile device and allow users to make and receive calls over both Wi-Fi and cellular networks, depending on their location. "When plugged into the dock, the ShoreTel Mobility client allows the device to use [Voice over Internet Protocol] over the Wi-Fi for better call quality, so users don't have to worry about call quality anymore," Pejman said. ShoreTel plans to support Android devices in future releases, and also to work with hardware partners, including Plantronics and Jabra, for accessories to the docking system, he said.